After a fun weekend of gaming, it is time to start writing up some reviews. First up is Skallywaggs . 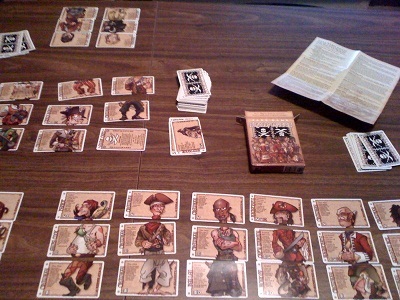 Skallywaggs is a simple pirate game in which each player is trying to get enough pirates in his crew in order to be able to set sail with his ship. In order to do this, each player matches up different cards representing a pirate's legs, chest, and head. If the player is able to play a set of these cards that are all for the same pirate (such as the "First Mate"), then they will get bonuses and it will be harder for their opponents to disrupt that pirate. Finally, there are also cards that allow a player to perform actions other than just simply matching. There is not too much to this game, so I will keep the pro's and con's section fairly abbreviated. When thinking of the pros and cons of this game, unfortunately, it's biggest pro is that it's "cute." This is a game that may attract some people because it seems neat at first (and is fairly inexpensive), but the pro's really stop right about there. The biggest con of this game is that its not particularly fun. All of the game mechanics work, but after about the third turn I was tired of playing the game - unfortunately it lasted closer to 20 turns before it was over. After discussing it with others after the game concluded, I realized that they didn't find it particularly fun, either. The strategy consists primarily of holding cards in your hand until you are able to match a pirate, and then hope that your opponent doesn't immediately get rid of that pirate on their turn. It really just did little to hold our attention. Overall, Skallywaggs receives a 5.0/10. This may be a game that children may be able to enjoy, but for the most part, I would recommend that you look at other games instead of purchasing this one. I was the other involved in the game and indeed did not overly enjoy it. Unfortnately it shall now collect dust on my shelf. I just wanted to add that this is a rather classic "snowball" game, in that once you start losing it becomes increadibly difficult to turn the tide. Maybe it would be different with more players, we just played 2 player, but I doubt it would get a lot better.